Penryn barely rescues her sister, Paige, back before she goes missing again. Penryn sets off through San Francisco and into the centre of the Angels' secrets lair, discovering secrets that could threaten all of humanity. Raffe is on another mission of his own, but must decide if he wants to save himself or Penryn before it becomes too late. 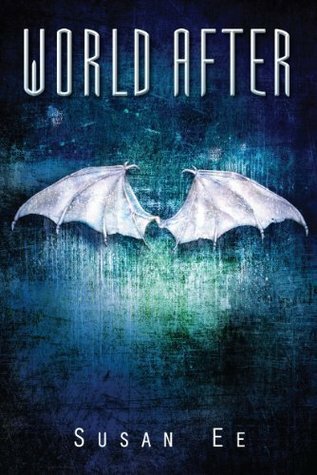 I wasn't very impressed with Angelfall, much like everyone else, but I absolutely loved World After. I flew through the second novel and was sucked into the storyline more than the first. The writing, plot, characters and setting were all solid and really boosted the quality of the novel. Susan Ee writes in a very unique and creative way, aiming towards Young Adult, but having enough gruesome and horrifying details that it's borderline creepy. I loved the tone, perfectly conveying the apocalyptic and decayed world. In this type of setting, it would never have worked if Ee's writing had not made it so believable and visually stimulating. Penryn has scaled up so high on my top female leads list, being badass but also humane - a trait not a lot of characters can really display properly. Raffe doesn't make much of an appearance, sadly, but I still enjoyed the scenes he were in and I missed his cocky manner. The plot was fast paced and easy to read, and has an addictive quality that makes me look forward to the next novel - a surprising factor considering I was iffy with the first novel. I've raved on about it, but there were some specific things I want to discuss as well. Ee is insanely creative and I love that, even if I was totally creeped out. The flying scorpions were a disturbing idea, especially the way they were bred - ugh *shiver*. I still can't really imagine Paige with her distorted features, but maybe that's because I refuse to, preferring to remember her as the innocent child in the wheelchair. I was waiting the entire time for Penryn to reunite with Raffe, because let's face it, even with all the violence and supernatural elements, them two together are very entertaining. I don't think I was disappointed because I liked that Penryn had time to herself and could prove that she was a heroine in her own right. I mean, when Raffe comes into the picture he sort of takes the whole saving "damsel in distress" thing pretty seriously. Thankfully it's demeaning or overshadowing. The ending was bittersweet, in that I loved that they ended up together, but know that bigger things are out there to challenge them again. Cannot wait!